Smart Energy Spray Foam offers infrared thermal imaging throughout the New York City metro region, both as part of our comprehensive home energy audit and as a stand-alone service designed to pinpoint energy waste and other building science issues. 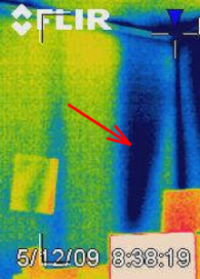 Having your home evaluated with an infrared scanner sheds valuable light on the effectiveness of your home's thermal envelope. An infrared scanner reveals hidden air leaks and areas where insulation isn't performing, and can also yield some interesting surprises -- such as where an uninsulated hot water pipe or recessed lights may be contributing to an ice dam, for an example. Infrared imaging is a valuable part of any good home energy audit, and a step that we guarantee to take with thoroughness and precision (although our experience tells us that it can also be a fun part of the energy audit for homeowners).